Book taxis & couriers all from the one platform. No need for two separate providers, Lynk are now offering a new service called Lynk Delivers. The new service will allow users to order courier drivers for instant on-demand pickups and deliveries. 3. 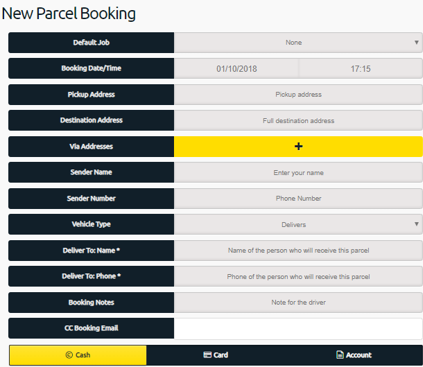 When you select “BOOK PARCEL” you are now booking a delivery driver and not a taxi driver. Fill out the booking form starting from the top and work your way down to the bottom. 4. As you enter your pickup & destination you will be given a price and time of arrival for your delivery. This will be shown on the map & includes VAT. 5. If you book for right away we aim to have a driver with you in 30 mins. You can also schedule a booking and a driver will collect when you’re ready. To pay for the delivery you can either pay by cash, card or you can use the same account as the one used for taxis.